Bolden doesn't want to be defined by narcolepsy and wants to be seen for his goals and aspirations, which include creating powerful music. From a young age, senior TJ Bolden showed unmatched creativity and determination. “I remember I went into my grandparent’s basement one day and I played a chord on the piano. After that I just loved the piano. So I started playing by ear and teaching myself, but I didn’t have a piano. I would always go to everybody’s house and be like ‘Hey, do you guys have a piano?’” Bolden said. Bolden grew up in the Acworth/Kennesaw area with his Mom, Dad, and two younger sisters. Music particularly inspires throughout his journey. “My neighbor got tired of me playing the piano because it was right next to the flat screen. They sold it to me, along with their drum set, so I started playing that. I was trying to find a way to play them at the same time, but it wasn’t working. 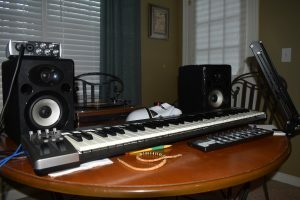 That got me into music production…I started to make my own music, and attach music to different emotions. I’d come up with all these stories…so I started filmmaking. Everything grew from a piano chord,” Bolden said. 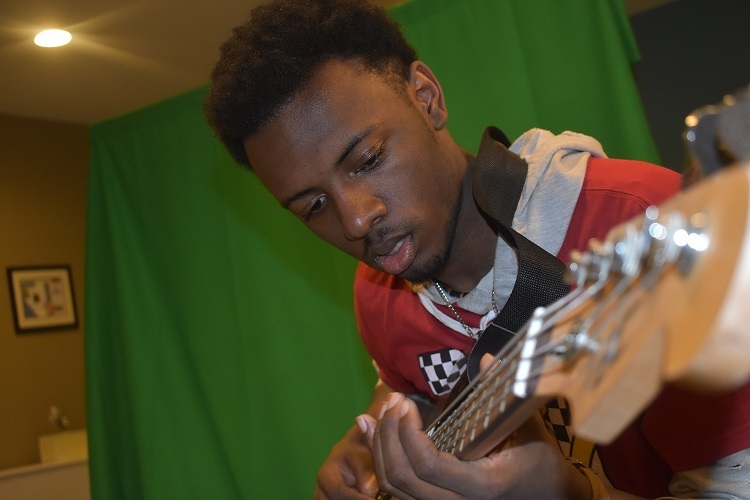 At just 18, the aspiring videographer managed to gain recognition for his thought provoking videos, refreshing pictures, and impromptu, yet brilliant original songs. His tenacity and dynamic spirit make it hard to believe that he has narcolepsy, a rare neurological disorder that affects 1 in 2,000 people; over 200,000 Americans, and three million people worldwide. People who suffer from narcolepsy experience excessive daytime sleepiness (EDS), irregular patterns in REM, vivid dreams, and sleep paralysis. However, unlike the average narcoleptic, Bolden does not suffer from narcolepsy. He fights it. “Honestly, I don’t want to be known by narcolepsy,” Bolden said. Though they can appear at any time during one’s life, symptoms of narcolepsy usually begin between the ages of 10 and 30. Sleep studies help identify narcolepsy using a series of medical tests that may include a polysomnogram (PSG), an overnight recording of brain and muscle activity, and a Multiple Sleep Latency Test (MSLT), which involves measuring how quickly a person falls asleep and whether or not they enter REM sleep. Symptoms may occur for years before doctors give an official diagnosis. “[I was diagnosed] In second grade, during the CRCT. I remember myself constantly falling asleep. In between [the sections] my teacher would let me go and take a nap. At first they assumed I was just tired, or that I didn’t get a good night’s sleep. So we had to go to different doctors and get different diagnoses. They did a sleep study… and that was how I found out I had narcolepsy,” Bolden said. Two types of narcolepsy exist. Type one narcoleptics (N+C) suffer from cataplexy, a sudden and uncontrollable weakness of the muscles, and posses low levels of the brain hormone hypocretin(also known as orexin). People with type two narcolepsy (N-C) do not suffer from cataplexy, rendering their narcolepsy less severe. They do experience excessive daytime sleepiness and may even possess normal levels of hypocretin. The two types share plenty of common ground regarding symptoms though. Making videos for SkillsUSA with Tomahawk provides joy and opportunities for focus for Bolden. “With narcolepsy, you go into REM faster, so the second you go to sleep, you go into REM. It may take the average person about an hour or an hour and a half to go into REM. So that means that I have very vivid dreams. It used to give me crazy nightmares, but over time I’ve learned to kind of control my dreams,” Bolden said. The most common symptoms of narcolepsy include an uncontrollable urge to sleep, the weakening of muscles, disrupted sleep or irregular sleeping patterns at night, automatic actions, feeling unable to move or speak when falling asleep or waking up, hallucinations, and lucid (sometimes frightening) dreams. “It causes your dreams to be very realistic. Now all of my dreams create a full story. You create your own reality, and you get accustomed to that, so you find yourself sleeping more,” Bolden said. The exact cause of narcolepsy remains unknown, but in special cases, genetics and family history may play a role in its development. With proper medication and lifestyle adjustments, people with narcolepsy can lead mostly normal lives. Drugs like Xyrem and Ritalin help counteract its symptoms, but cannot cure narcolepsy. Scheduling naps, eating healthy foods, and avoiding electronics before bed can aid in building a consistent routine to combat irregular sleeping patterns. “I’m fine as long as I have medication. Other than that, it’s like if I don’t tell you I have narcolepsy, it would be pretty straight. You could live around me and probably not even know I have narcolepsy,” Bolden said. Bolden admits that school remains a challenge, even in his senior year. “I might go home and sleep for four or five hours, which is horrible because you wake up and then you eat dinner and now you’re really sleepy because it’s time to go to sleep. You can’t explain that to your teachers,” Bolden said. Because narcolepsy develops during teen years, young people with the disorder may find it hard to balance schoolwork, extracurriculars, and social activities while designating time to sleep. Studying, concentration, memory, and attention span may be periodically impaired by sleep. After a rocky freshman year, Bolden quickly learned how to juggle his busy schedule. He claims he never fell into a set routine, and simply adapted to the nature of an unpredictable agenda. With hard work, he keeps his grades up to par, but, as usual, continues to strive for more. “I see a lot of Bs on my report cards, which I don’t exactly like. I know I’m capable of getting As. They say the average kid with narcolepsy get Cs and Ds. Even though I’m doing better than the average narcoleptic, there’s still room for improvement,” Bolden said. Bolden’s ambition often outweighs his narcolepsy. “Sometimes he has to get a nap in when other kids are able to just get started. But overall, I can’t say that [his narcolepsy] has really held him back because of his drive and determination,” Tanya Bolden, TJ’s mother, said. In the future, Bolden plans on attending college and pursuing a career in film, which motivates him greatly. “When I’m in my groggy state, I really don’t wanna do anything but sleep…When I get into my film mindset, I put my all into it… I have to figure out ways to make sure that when I’m tired, I’m still motivated,” Bolden said. Bolden’s videos rely on music to convey a certain mood. He makes videos that can match the how the songs make people feel. He wants to create a unique style of music for himself- one that listeners can easily distinguish from other songs. Although Bolden does not know what the future holds in terms of his narcolepsy, he knows his future in filmmaking is bright. “Narcolepsy sometimes says differently, but I know that in most situations, I’m the type to keep on working on something until I know it’s impossible. I’m determined and easily inspired,” Bolden said.